Obsessed with Scrapbooking: Hello Kitty Scrapbooking Projects and GIVEAWAY! Hello Kitty Scrapbooking Projects and GIVEAWAY! When I received the Hello Kitty package of goodies I showed you in THIS VIDEO, I immediately thought of my wonderfully creative and talented friend Stefani, who I know is a HUGE Hello Kitty fan. So, it made sense to see if she wanted to make a few things with the product line. Check it all out below and be sure to enter the giveaway at the end of the post! Hey, Y'all it's Stefani with Styles by Stefani here and I'm super stoked to be a guest designer today at Obsessed with Scrapbooking. As soon as I saw Joy's video on the upcoming Hello Kitty line, I knew I had to have the paper pad and I knew I wanted to make a banner with it. That was all I could think about until I actually looked through all of the products and then my juices got flowing! This line has so many cute aspects that it made it so easy to make some unique items quickly. First, I'll show you the banner that I made! Love the colors in the line. They go so well with the Air Mail and Traveling theme, but I can see it for a birthday party, baby shower and many other party themes, too! Next up are the projects that I made with some of the stickers, die cuts, and washi tape in the line. I used a Cricut box to make a stationary kit (love the little paper clips). I hope you enjoyed my projects and that you will stop by my blog at http://www.stylesbystefani.blogspot.com/ for more details about them and a chance to win some crafty goodness from my house to yours. Didn't Stefani just make the cutest things?? I love the banner - it is so fun and clever! And that little stationary kit is super adorable and brilliant! She is also having a giveaway so be sure and swing by Stefani's blog at http://www.stylesbystefani.blogspot.com/ . To enter the giveaway shown above *, enter using the Rafflecopter form below! Finally, these Hello Kitty scrapbooking items are coming to a Michaels near you by October 28, 2012 so be sure to check them out in person - they are beyond cute! My favorite project is the stationary kit. My daughter is a huge Hello Kitty fan. In fact, my younger daughter calls Hello Kitty Ellie Kitty (kinda sounds the same right), since she associates HK with her sister. I love the stationary kit. So much fun. I love both projects but the stationary set is my favorite because it's just so clever! Thanks for sharing! I really like all the things that were made...the tin and the tissue box are my favorite. Oh wow what great project I heart Hello Kitty and I love the stationary kit. I want to have all of the Hello Kitty products. Stephanie are you ever creative. Joy thanks for the chance to win some awesome things. Love both! Hard to choose! Ahhh, banner. No, stationary! Wait, banner! Oh no! Can I say both? Wow, what creative ideas. If I had to choose one as a favorite, I'd say the stationery box. I have a Hello Kitty Scrapbook Room...It didn't start out to be Hello Kitty...I painted it pink and my daughter started giving me some Hello Kitty stuff, then her soldier boyfriend was stationed in Korea and he brought me back more Hello Kitty! I love the banner but the stationary box is just soooo cool. Love the stationary kit. What a great way to use a cricut box! I really love that super cute stationary kit! Your banner is sooo cute! I love the stationary kit! and would love to use it with my grand daughter! I love, love love the banner! love that banner its super cute! OMG hyperventaling....I love the stationary kit. I love the super cute stationary set...the tissue box is close second!! Love the Hello Kitty projects! The stationery kit would be fab for my nieces. I love the stationery kit. Although the banner is very cute! Love the stationary kit!! The banner is adorable to. I like both projects, both very cute. If I have to pick one, I would pick the stationary kit. So cute! I just love Hello Kitty, my favorite is the stationary kit. Ii like the banner best - so cute! This is such a cute line. I'm so glad you shared it! Thank you for an awesome giveaway! Now this is a real hard choice. They are both great but if I have to choose I'd have to say the stationary set no the banner no the stationary set. Okay the stationary set. lol. Seriously I do love them both. Awesome projects. Great giveaway. Thank you for sharing. I really love the stationary set!!! They are both great though! Thank you for the chance! I love the stationary kit. What a wonderful gift to a young one to encourage writing. I love both projects but I would have to say that I Love that stationary set!!! Love hello kitty!!! The banner is awesome!! Thanks for the chance to win! I love the stationery kit. It would be so perfect for my little granddaughter. 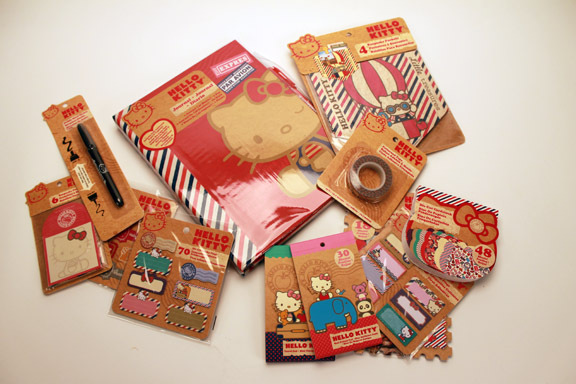 The Stationary Kit is so clever and would make an AWESOME gift for a Hello Kitty fan! Definitely my fave! I simply love this kit it has a lot of great ideas. Thanks for sharing. I love the banner, I have not made one yet but with this inspiration I am getting closer. I like the stationary kit! So much fun for a little girl! Love the banner too cute but honestly I love it ALL!! Super cute banner! I love Hello Kitty! The banner is just adorable -- can use one for any and all occasions! I think I like them both, the banner is super cute, but the stationary set would be a useful little gift. This Hello Kitty line is so cute and I can't wait for it to get to a Michael's by me because my Grangirl LOVES Hello Kitty! I like the banner the most. Love cats always have and hello kitty is just as adorable as any kitten. love it all. Everything is awesome but love, love,love the banner! TFS and for the chance to win, now off to visit Stefani, have a great day! I really like both of them, but my favorite is the banner, I love making banners and this one is super cute. Lovely products! My favourite is the stationary set, it would make a great Christmas present. Thanks for the chance to win. I love all your creations Stefani you really did such an Amazing Card showcasing all that Hello Kitty Goodies. TFS. I love banners, but a stationary kit reminds me of all the Sanrio stuff I used to have to write to my penpals! So I like the stationary kit for nostalgic reasons. I have a daughter & her 3 daughters that would love the stationary kit. Both projects are adorable! I really love the stationary kit though! What a great idea!! The stationary kit. What little girl wouldn't love this? I love the banner, however I have a lots of cartridge boxes and have wondered if I dare create something with them or juse keep them for...? I don't even know why I should keep them cause my carts arent in them so the stationary project was pure inspiration for me. Love the stationary kit. I have to try and make one for my granddaughter Mikayla (she's the biggest Hello Kitty fan ever). I so regret never getting the hello Kitty cart but with the great giveaway I could probably put something together for her. Thanks for the chance to win and most of all thanks so much for all the inspiration. I love the new Hello Kitty line. I think I love the "kraft" look in the background.....it looks great!! I love all of this line. Can't wait to get my hands on it. I love the little box that was made out of a cricut box. I like the stationary kit! I like the banner best! I love the banner!! Hello Kitty has always been one of my favorite Cricut carts!!! Keeping my fingers crossed to win! Good luck to all. Thanks got another great give away. Pick Mr, pick me! I love hello Kitty! What an awesome collection! I now know exactly what to give my Hello Kitty loving granddaughter for her 11th birthday! I love the stationary kit. Thanks for the chance to win. I am so excited about these new products! I love the stationary kit Stefanie made! I love the Hello Kitty tape and was thinking to use it like washi tape on a layout or journal. Everything looks like fun!! I have a HK Organizer box in my scrap room and love how it puts a smile on my face!! I love the stationeary Kit, so cute!! My favorite is probably that stationary kit! It's too cute! Thanks for the chance at the sweet giveaway. Went over to Stefani. I'm just a HK fan from the word go! I think they are both so cute, but I would have to say the stationary kit. Those paper clips are so adorable! The banner is a great idea for a child or adult who is a fan of Hello Kitty! It would be a great centerpiece for all the other items. Love the banner and that paper! LOVE, LOVE, LOVE tha banner kit!! So stinkin' cut! Love them both but that banner would look adorable up in my grand-daughter's room!! ....then again, that stationery kit is awfully cute! Oh these are so darn cute! LOVE Hello Kitty in any shape or form but especially love the little stationery kit! My favorite project is the stationery kit but they are both adorable. Thanks for the chance to win! Love the die cut. My daughter's love Hello Kitty. I was never a big banner person but have seen a few lately that really turned my head & this is surely one of them!! This is SO cute I can hardly stand looking at it!! My BFF bought my Daughter a Hello Kitty about 26 yrs ago! If I knew then what I have seen now, we would still have it!! :( Thanks for the giveaway! My favorite is the stationary kit! Adorable! The banner is really cute!!! I loved the stationery kit - my granddaughers are going to love this set! Both projects are awesome! I guess I like the colors and the cute Hello Kittiness of the banner, though! Thanks for the chance and for more Hello Kitty cuteness! Love the banner and what you did with the the cricut box. I love those stationery items!!! Super cute! I love he banner. So fun. The stationery kit is so Hello Kitty....love it! I love the Banner! Thank you for the giveaway! awesome products-----I like the tape. The stationary kit is fun looking too though. Excellent!!! It's pink and it's Hello Kitty. What's not to love. Hello Kitty is the cutest! I love the banner. The stationary kit is so sweet! love it! the banner is very cute, but that kit is my favorite! I love the stationary kit! Everything is so cute in this line, I love it all! I use to buy Hello Kitty for my daughter when she was little. It is hard to believe she is 30 years old. I really love the banner! Neat giveaway! but all the projects are so sweet. That stationary kit is so creative! Thanks! I am lost for words! I need this!! My three year old granddaughter has recently discovered hello "cat" and she is so in love! it would be awesome to own this for the many projects Grace wants already! I love the stationary kit! Both are awesome but the station kit is sooo fab ! The banner is my favorite...so cute! My play niece is absolutely nuts about Hello Kitty everything. She would love this cartridge. My granddaughter is crazy about Hello Kitty. I love the Banner. I can't wait to get the stuff when it arrives at Michaels - perfect for Christmas gifts. Love Hello Kitty I was at Fry's electrons and they had a microwave my little boy that it was toy. Thanks for sharing, God bless. I had no idea they were coming into the scrapbooking world and to a Michaels near me too! Thanks for the chance to win hope I did everything right! Love the Hello Kitty package. Would love to win it! I love the stationary. Thanks for the chance to win. My favorite is the stationary kit with all the cute little clips and envies and everything else! The banner is my favourite. I just love Hello Kitty. love the banner. My daughter loves hello kitty. I love the stationary kit! I could do so much for my nieces! I love the banner and how you used the negative to represent the letters. Thanks for the giveaway! I Love the stationary kit! There are so many things to use!! Thanks for sharing! !